How does care manifest – or fail to manifest – in our practices, policies, structures, spaces, technologies and pedagogies? How could we be better caretakers and caregivers in the context of post-secondary education and in service of student learning? 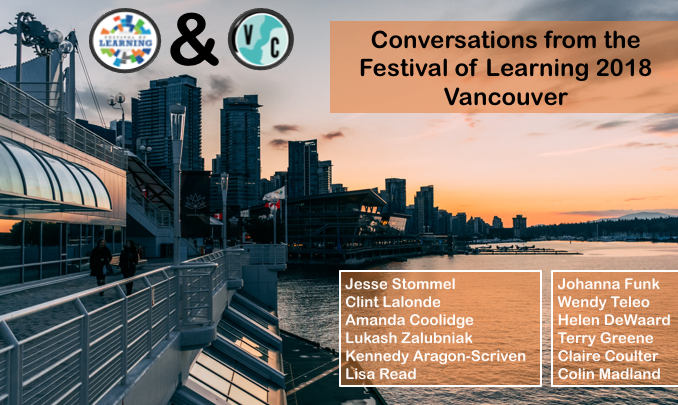 If you can’t make it to Vancouver, you can join any of the Virtually Connecting sessions to join into this conversation. Monday, May 28th at 11:30 a.m.
We’ll chat with Jesse Stommel (@Jessifer). The onsite buddy will be Clint Lalonde (@edtechfactotum) and the virtual buddy will be Helen DeWaard (@hj_dewaard). Tuesday, May 29th at 11:30 a.m.
We’ll chat with Lukash Zalubniak and Kennedy Aragon-Scriven from the student panel keynote about student mental health and advocacy. The onsite buddy will be Clint Lalonde and the virtual buddy will be Terry Greene (@greeneterry). Tuesday, May 29th at 4:00 p.m.
Our onsite guests will be Lisa Read. The onsite buddies will be Colin Madland and Johanna Funk (@johannafunk1). The virtual buddy will be Wendy Taleo (@wentale). Wednesday, May 30th at 12:30 p.m. The onsite buddy is Amanda Coolidge (@acoolidge) and the virtual buddy is Helen DeWaard. If you’d like to join any of these sessions – drop a comment in the comment section below, including an email contact so we can send you the join link. OR send us a response on Twitter – tweet or DM (direct message). I would like to join for Monday’s session.